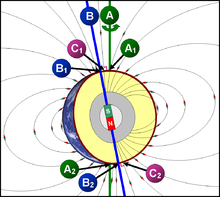 A geografical axis o rotation A (green), an shawin the north geografical pole A1, an sooth geografical pole A2; an aa shawin a magnetic field an the magnetic axis o rotation B (blue), an the north magnetic pole B2, an sooth magnetic pole B1. A geografical pole is either o the twa pynts on a planet, dwarf planet or naitural satellite, or a "lairge" rotatin bouk or sphere whaur the bouk's axis o rotation intersects its surface. This page wis last eeditit on 11 Julie 2016, at 22:08.